Suffering from wanderlust due to all this amazing weather? Time for a tiki party! 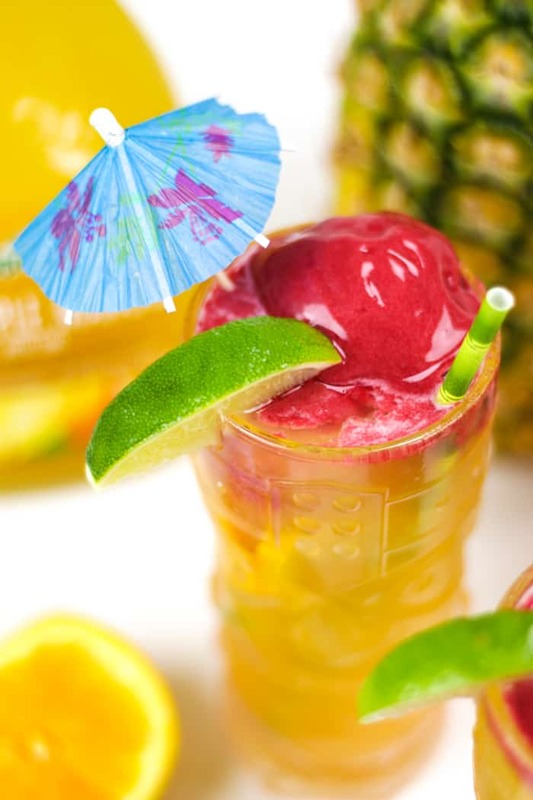 Serve up a pitcher of this fruity Pineapple Mango Tiki Punch with a scoop of raspberry sorbet. 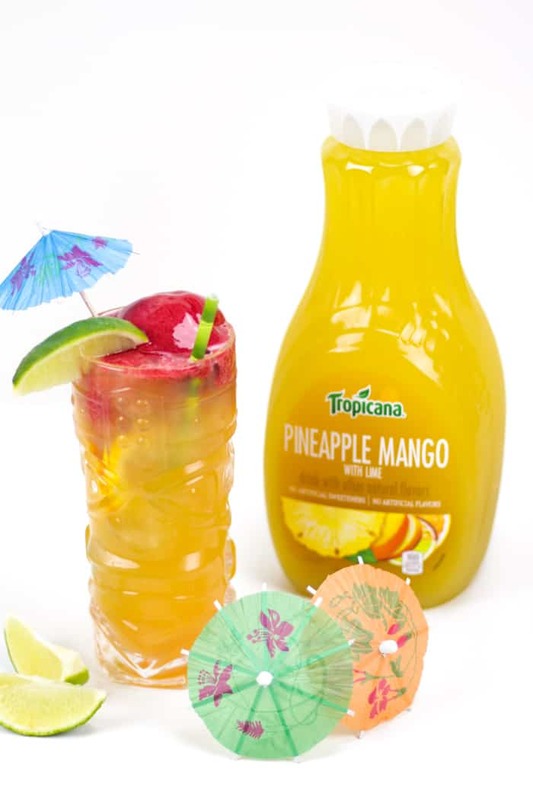 It stars a homemade spiced rum and Tropicana® Premium Pineapple Mango with Lime drink. Scroll down to see the video! All summer long I have been dreaming of tropical destinations. The weather has been stunning lately, and all I want to do is be outside on a beach catching up on my growing pile of magazines. As much as I love travel, I’ve somehow never stepped foot on a beach with crystal clear water. I’ve never really been a “beach girl” but I think that is changing because I’ve been obsessed with all things Hawaii lately. My dad recently went to Hawaii and has been sharing tales and photos of his travels. What a seriously beautiful place! I have to go. One thing that really intrigues me about Hawaii is the — don’t be surprised — cocktails! 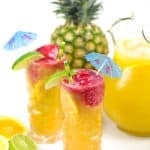 An abundance of fresh fruit, bright flowers as garnishes, creative drinking vessels like whole coconuts and pineapple, fun straws and cocktail umbrellas… It’s all so inspiring for a cocktail fiend like me! My taste buds might actually be coming around to coconut — finally — after a lifetime of hating anything to do with it. To help soothe the wanderlust I’m experiencing, I’ve been reading these two tiki cocktail books: Smuggler’s Cove and Tiki with a Twist. Tiki culture is totally fascinating to me right now. 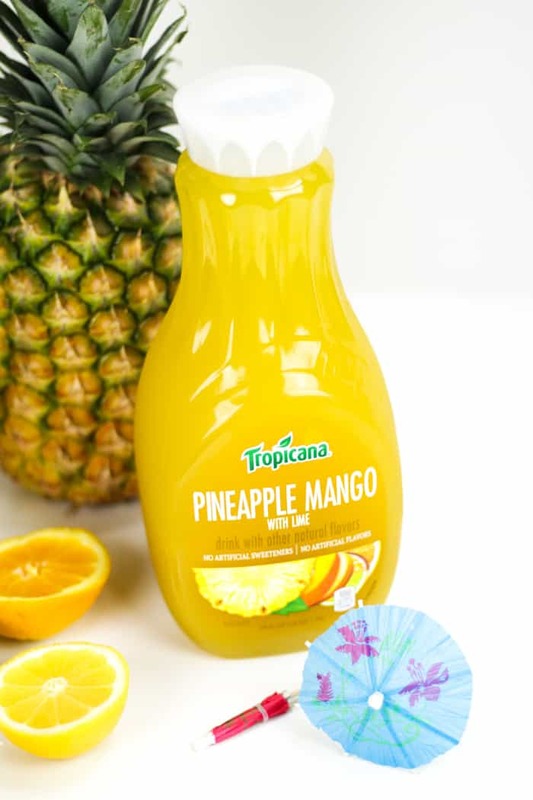 When Tropicana invited me to make cocktails with their Premium line of juices, I had to say yes. 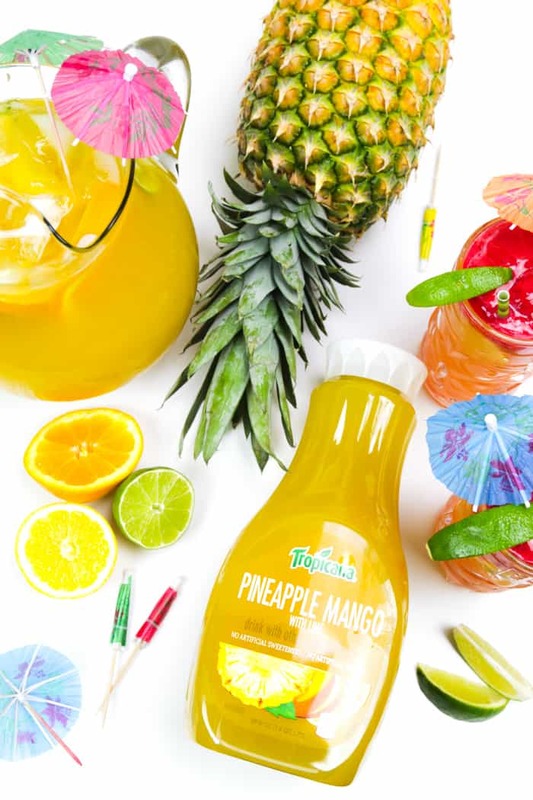 And as soon as I heard the Tropicana® Pineapple Mango with Lime drink was in the lineup, I knew I had to make it into a a tiki cocktail. 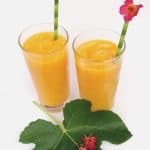 This drink is flavorful and fruity, something you will want to sip all summer long. 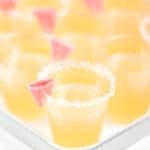 Surprisingly, I have few tiki-inspired drinks on the blog. 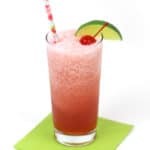 Perhaps this Frozen Mango Daiquiri would count, or maybe this Guava Cosmopolitan? 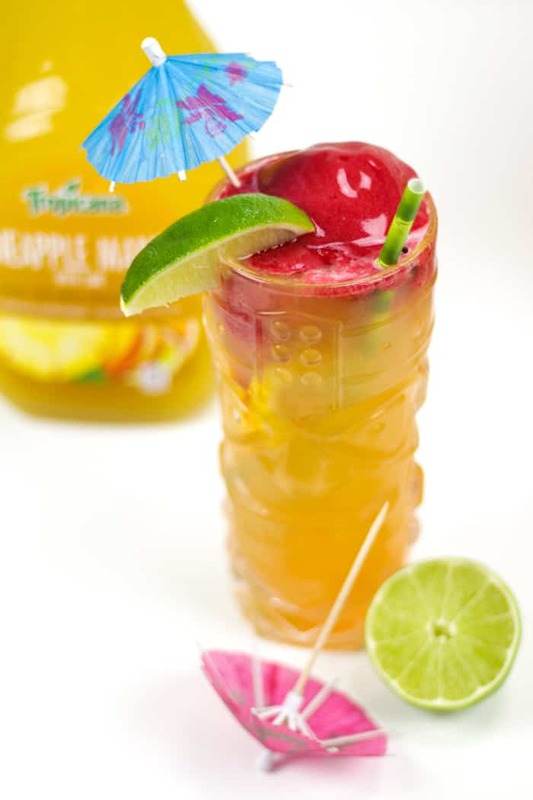 I am fixing that now with today’s Pineapple Mango Tiki Punch recipe and Tropicana’s help. In addition to Tropicana’s goodness, there’s a homemade spiced rum that is WAY better than storebought. Plus, a splash of triple sec, lime juice and lemon juice. 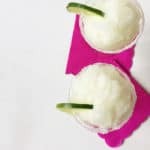 Each glass is topped off with a scoop of sorbet — I used raspberry but lemon, mango or lime would be delicious too! Then, it’s topped off with a cocktail umbrella! The whole thing tastes divine, and will let you pretend you are sipping it out of a pineapple on a beach in Hawaii. Or any beach, really. 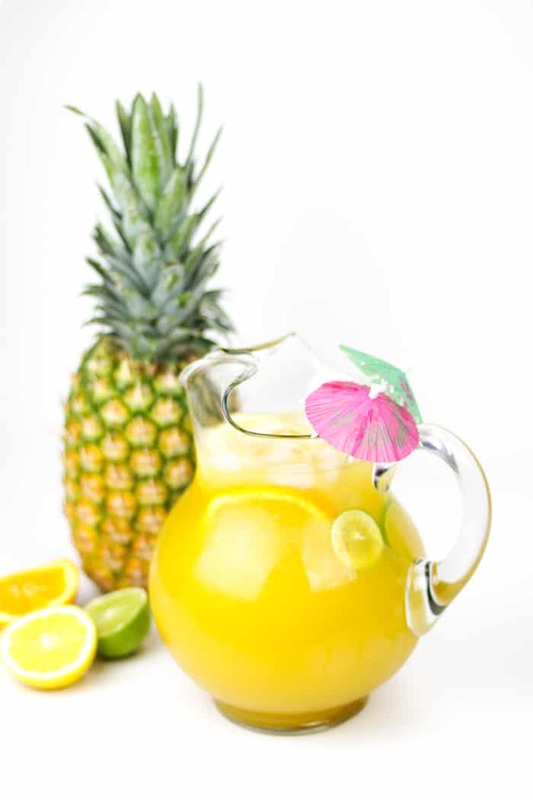 This Pineapple Mango Tiki Punch will be perfect for an impromptu tiki party this summer. It should soothe your wanderlust and your worries, even just temporarily! All thanks to Tropicana. At your next tiki party, take the punch bowl to the next level. Fill a 16-ounce mason jar with ginger root, star anise, peppercorns, cloves, cinnamon stick and vanilla extract. Fill jar with rum. Cover and let infuse for 24 hours. Strain rum through a fine meshed strainer into a bowl. Decant back into jar and replace lid. Spiced rum will keep indefinitely. 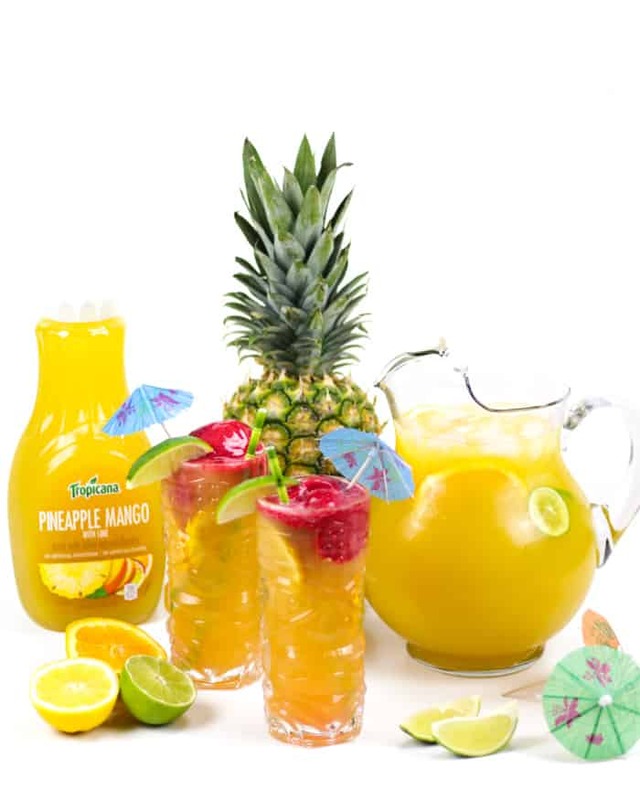 Fill a 64-ounce pitcher with lime juice, lemon juice, triple sec, rum and Tropicana® Pineapple Mango with Lime drink. Stir to combine. Add 1-2 cups ice. Garnish with slices of orange, lime and lemon. Pour punch into a tiki glass almost to the top. Add a scoop of sorbet. Garnish with a lime wedge, straw and cocktail parasol. I’m ALL for this cocktail, lady! What a delicious, sweet treat for the summertime! It is so good, Erin! All the Hawaiian cocktails, please! 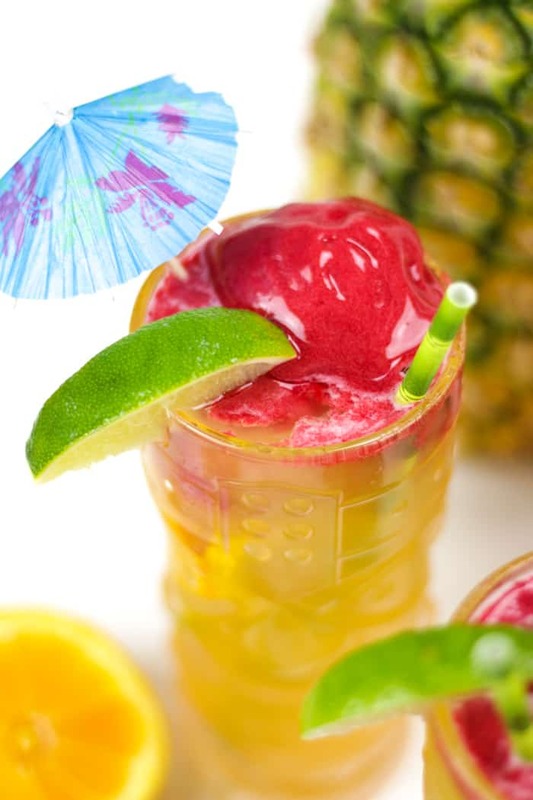 This cocktail SCREAMS summertime. I can’t wait to try it! Thank you! I’m such a huge fan. We keep making it — it’s just so good!